Quinodoz SA et al. (2018)Higher-Order Inter-chromosomal Hubs Shape 3D Genome Organization in the Nucleus. Eukaryotic genomes are packaged into a 3-dimensional structure in the nucleus. Current methods for studying genome-wide structure are based on proximity ligation. However, this approach can fail to detect known structures, such as interactions with nuclear bodies, because these DNA regions can be too far apart to directly ligate. Accordingly, our overall understanding of genome organization remains incomplete. Here, we develop split-pool recognition of interactions by tag extension (SPRITE), a method that enables genome-wide detection of higher-order interactions within the nucleus. Using SPRITE, we recapitulate known structures identified by proximity ligation and identify additional interactions occurring across larger distances, including two hubs of inter-chromosomal interactions that are arranged around the nucleolus and nuclear speckles. We show that a substantial fraction of the genome exhibits preferential organization relative to these nuclear bodies. Our results generate a global model whereby nuclear bodies act as inter-chromosomal hubs that shape the overall packaging of DNA in the nucleus. SPRITE is a method to detect and quantify genome-wide higher-order interactions that occur simultaneously within the same nucleus. It was first published in 2018, and it aims to address certain limitations of proximity ligation and imaging methods. Compared to proximity ligation methods, this technique does not depend on the ligation of spatially close DNA fragments; therefore, it can detect interactions occurring across larger distances in the genome. Additionally, unlike both methods that can only capture simultaneous interactions between a small number of genomic regions (2-3), this technique is able to capture simultaneous interactions between a larger number of genomic regions. The protocol involves cross-linking the cells to form links between physically adjacent DNA regions and other interacting molecules such as RNA and proteins. Then, the cells are lysed, and a restriction enzyme is used to digest the chromatin into multiple fragments. The cross-linked complexes are coupled to magnetic beads. A split-pool tagging strategy is performed that consists of splitting the cross-linked complexes across a 96 well plate, and ligating a tag sequence unique to each well to each molecule. The wells are then pooled and this process is repeated several times. 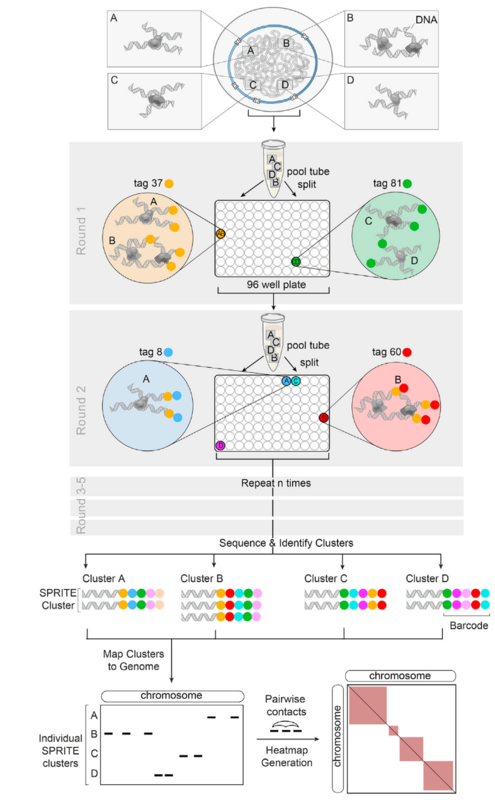 The molecules located in the same complex will stick together throughout the entire split-pool process, resulting in them having the same barcode combination at the end, while the molecules located in other complexes will have their own distinct barcode combinations. The molecules are sequenced, and all the reads containing the same unique barcode combination are grouped together into a cluster. Initial processing results in the generation of a clusters file where each cluster occupies one line that includes the barcode name and genomic alignments of that cluster. This can be used for additional analysis and to create visualizations. See Quinodoz et. al. Cell 2018 for more details.